Google not only serves adverts to online newspaper readers, but to Gmail and YouTube users, and to people visiting millions of other sites - virtually the entire internet. The effect, inventory to serve adverts has increased, and now those buying adverts have more information on what they are buying. The result, advert prices have hit rock bottom. Thus, newspapers coming online have more readership as they theoretically can reach everyone with an Internet connection, barring those in China depending on how the Chinese government feels. The increased readership, however, does not translate to increased revenue. 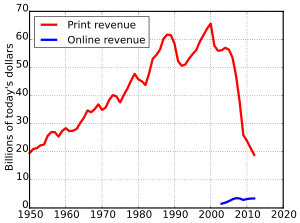 Revenue, instead, decreased by a huge margin. The effect is felt more and more as a newspaper’s readership migrates to internet usage and stops buying papers, opting for the free news online. Some media houses have tried to optimise for this behaviour by trying to sell as many “views” as possible. The challenge though is that a day still has 24 hours, and people can only spend as much time on all the content online vying for their attention. Publications like Britain’s Daily Mail have succeeded in the eyeball race, and the Daily Mail is said to be the world’s largest English site. The secret - sensationalism and low-quality celebrity gossip news. In the US, media houses struggled before a few realised that there are other internet models. The New York Times now sticks to “high quality” news, offering ten free articles a month and offering those who read more than ten articles subscription starting at $1.25 a week (Kshs. 125 a week). This is a model that The Economist identified many years ago, though it does not come cheap online, costing $62 for 12 weeks or Kshs. 500 a week. Other publications deploying this freemium model include The Harvard Business Review. Notice that most of these publications are targeted towards high-income earners. In Kenya, we are still in the early internet days, but at the verge of the so-called “tipping point”, where much more is done online than offline. The main dailies are struggling to adapt to the ongoing changes, with an indication they might not have studied what to do and what not to do from the western world. For instance, many news websites still reflect the inefficient layout of a newspaper, featuring curated articles on the front page. The good thing about the internet is that it allows you to offer the same product customised to different tastes. Print newspapers try to cater to politics, with so-called narrow interests hidden inside the paper - business, women and lifestyle, and sports at the back. Their websites reflect this layout. However, as the Daily Nation realised, there is a sizeable interest in cars and increased Barasa’s column over time. Similarly, the Business Daily proves that there is a section of readers who are only interested in business news. Serving personalised website layouts is difficult. What however can be achieved is serving an all-in-one view website designed such that the reader is free to choose what to read, without being distracted by lots of text, adverts and imagery on the front page. Other ways to achieve this is by using secondary channels to post links or news snippets. Twitter used to work well here, but of late, Telegram has emerged as the curator’s channel of choice. In Kenya, bloggers have been quick to experiment with Telegram, something that Techweez has been actively using for months. Kenyan Wall Street is similarly another blog that has recently deployed on Telegram, as have various publications from the Standard Media Group. Telegram allows a subscriber to see what they haven’t read and to pick what they would like to read. It achieves what newspapers have been trying to achieve online, more articles per reader. Twitter remains a potent channel, where a publication can customise its readership based on different interests - politics, entertainment, motoring, sports, technology and more. Similarly, publications can experiment with such Telegram channels. Websites, however, remain the best online asset. The good thing, creating an all-inclusive website such as the Economist’s print edition can be done while maintaining your current news site. In addition, websites do not suffer from the limitation of 48 - 60 pages of a paper. Thus, departments that are restricted in print by the number of pages- such as Business, Lifestyle, Women - have more leeway to play around with more content online. At the same time, advertising and sales units in media houses can also experiment with alternate models. Rather than packaging the entire website as a unit, different sections can be unbundled and sold at lower, more attractive prices to different sectors. For example, a motoring section can be branded or sold to players in the sector, while a technology section could be sold to technology players and so on. In addition, local media houses can target "premium" readers with subscriptions. Sections or websites targeted at so called professionals can include a quota of free articles and subscriptions of, say, Kshs. 50 - Kshs. per week, or Kshs. 200 - Kshs. 300 per month. Silicon Valley’s “Fail fast, learn fast” mantra highlights the learning opportunities that the internet provides. The costs and barriers to experimenting are lower; you can take advantage of the lesser resources needed to experiment with what works better.